This is from my Fan-fic which was inspired by Percy Jackson. This is a fun Roleplay, anyone can join but do the forum on the RP sign up. Tian put on his glasses, and went outside, He was hated by most of the camp members because he was the one the broke Discord out last year.Amber, Iris, and Maddie seemed to be the only ones who trusted him. Shelton passed by him carrying some books, and ignored contact with him.It was just last year, why is everyone here still mad at me, he thought. Slvia stopped and said hello. She was also hated because she helped Nightmare moon 2 years ago. Diaminse smirked at Tian,while he was talking to Simba Hooves. Amoria smiled at him, since he was the son of Discord, Screwball's Children liked him "No mater what the Tragic Costs", He walked into the cafeteria, he smiled, the chief gave some vegetbles with an apple, "Keep the apple, a small bit of love? kidding, of how about popcorn or cotten cady, I love cotton Candy"
A girl who was very different had walked into the cafeteria. She looked around at the other mates who were there, seeing the line and went up to it. The pony stood a little shorter, since her flippers didn't go perfectly straight or else they would hurt. But, she had the wings to help lift her up to look at the lady serving. She recieved the small bit of vegetables and the apple as well, then waddled away to a table all by her self. No pony knew what her other parent was, but since she was thought to be descended of the great sea legend Neptune (( in Pony stuffs )) she was allowed in. So without further ado... Sonais Crescent, began to eat the apple. She flipped her tail around a bit while sitting down and picked up this apple with the fingers that she had. The pony/kelpie examined the apple before biting down, seeing its red color and its shape. "This apple... It grows on a tree in the earth, and we pick it so that we can feed ourselves. Thank you for being there to nurture us, or else most of us wouldn't live.."
Four years....it has been four years since Guardian Angel has set foot back in Equestria. When he was sixteen, Princess Celestia saw the potential that is inside him and sent him away. And now finally after being gone for so long, he has finally returned. Upon his return he was instructed by his superior officer that he will no longer be in the Guard. Instead, he is sent away to a Camp that is for Ponies like him. After searching for days he finally sees the camp in question come into view. He lifted his visor up from his helmet in amazement. The place was not very big, but it was something he has never seen. The reason that he is sent here is because of an incident that happened a month before he was able to return. He never told anyone but his master who watched over his training. With a satisfying sigh, he continues on his way to the camp. When he arrives, he notices that most of the camp is empty, "Must be lunch time." he mumbled to himself as he looked around for the cafeteria. Once he found the location, he walked inside grabbed his food and found a place for him to sit. For right now he rather eat alone, then meet someone who will become his friend. Days, months, years. Thunder Dash had gone through so much as a major in the army, both in the human and pony world. From taking care of issues with the Griffons in the Griffon Kingdom, to stopping deadly terrorists from destroying America, Thunder Dash had completed many tasks during his time working with both the US and Equestrian Army. Thunder Dash landed in the camp. Relieved that his time in the Equestrian Army had come to an end (for now), he took this time to meet new ponies before he would have to deported again. After all, he was a Major in the Army and the major is the one who gets called the most, besides the colonel and lieutenant. Tian smiled at the lady, "I'm not hungry" (Which was a lie) and sat down with Amber and the other two. He made cotton candy go into his hand (Don't ask me or him how he did it) and got some popcorn magically. "Better then vegetables, wait, can I have one of your guys apples" Amber smiled and gave him his, "I don't need it", Tian grabbed it and put it in his popcorn bag. I should do this more often, He thought, he took a bite of cotton candy and grinned. He took another bite Nom-nom-nom, and said, "I'm thirsty, and I haven't tried my rain before." "By Celestria, don't do it in here, Tian" Maddie whispered. "I really am thirsty,By Discord I was just kidding, what's the fun in making sense, literately " Tian responded with a laugh. "Anything else, Tian?" Iris asked with a laugh. "Well, yeah, I'm getting into Warriors, I'm Chaospath of Leafclan"
"Is this a roleplaying thing?" Iris asked. "Nope, I joined that club, remember?" "Yep, they put you in groups, it's after lunch, we go and RP, I turn into a Black and Dark grey cat with Crimson eyes and..."
"Ok, that sounds fun" Amber said, "I love kitties"
"I will get exhiled from there and become a rough, that big rock at the tree is a Moonstone, I'll go and become a leader of my own clan,Imagine me, -he stands up on top of his Chair and puts his food on the table, he smiled- Chaosstar of Chaosclan"
At first, Sonais didn't notice the yellow pony zap to where he was at that moment. She was too busy studying the core of the apple that she had finished eating shortly after, looking around at the internal structure and the seeds. After looking at it for quite some time, she set it back down from her four long, slimy looking fingers and stretched out a bit. Upon that time was when she noticed someone sitting next to her, and practically flipped out of her seat. But instead, she quickly flew a few feet away from Thunder and looked to him for a bit, until they made eye contact that is. Then she just blushed and looked down at the ground, landing quietly but made a tiny squish noise from her skin being kind of moist. "Errr, heheh... Um, I, I didnt see you there, i'm sorry... L-last time I checked, no pony was sitting next to me, because, I kinda.. Didnt want to sit near anyone.. I-it's alright, though... You can stay here, I, I dont mind it.."
Clearly, Sona was a very shy girl, since her reaction to Thunder being there was quite something indeed. But she stood there, not backing off to wait for a reply..
"Oh, sorry about that..." Thunder Dash said as he slowly inched closer to the pony that moved away from him when he appeared. He read the green pony's shyness, which caused the electric currents in his body to slow down a little. His energy level had increased since he performed the teleportation. "You look like you're studying that apple quite deeply." Thunder Dash stated as he looked at the apple split into several parts including the core, the seeds and other parts of it. "Oh, by the way. My name's Thunder Dash. I appeared next to you using a special ability I got when I was a little colt. It's quite a story. What's your name?" Thunder Dash asked not wanting to offend the green pony. He knew that it would take a little while for the green pony to respond since she was quite shy and preferred to be studying the apple, rather than paying attention to him. He waited patiently for the pony to respond to his question. He was used to being around shy ponies, as there were quite a few during his time as a Major in the army. "Urr, uh... M-my name.. It's...."
It took Sona a long pause before thinking a bit, but since she knew that Thunder wasn't going to do anything harmful to her, it raised up her confidence just a tad. ".... S-Sonias... Crescent.. Ponies, call me Sona..."
But after introducing, it felt like a burden had come off of her back. She sighed and looked up to the other pony, a bit nervous still but managed to be able to face directly to him. She was able to study him closer now, and remembered about what he said about how he had ended up next to her. "I-I, was studying the apple... It was interesting, knowing that it feeds us, sustains us, and lets us prosper.. It's a wonderful gift, a-and, it all starts, from a seed...."
Anyways, Sona took another long pause and began to slowly relax herself. Though the pegasus in front of her seemed intimidating by the flashy yellow and black colors, she managed to deal with it all. "So, um.. T-Thunder... Tell me, about, the special ability, please... You're, not exactly a unicorn, but the way you explained... It, it seemed like magic to me.. A-are, you like my mother..?" "Huh? Let me guess...was your mother a pegasus like me? Anyway, I have the ability to wield electricity inside my body and convert to power used for magic. If you want to know how I got it...well...it all started with a normal day up in Cloudsdale. It was the day that I would graduate out of Jr. Flight Camp. Without warning, a storm brewed and a pegasus went missing in it. The Wonderbolts tried to find her but they couldn't. That's when I tried to go find her. Of course, ponies were screaming and shouting for me to not go in there. As I zoomed through the storm, I searched everywhere. Suddenly, boom! I was struck by lightning! Thought I would go down right? Wrong! You see, my genetic code is different from that of other pegasai. A mutation happened, that caused my body to be able to absorb electricity and wield it. In the end, I rescued the pegasus and got my abilities." Thunder Dash said. He then gathered some electricity and made a green apple appear from the blue. He then took a bite in it. "Anything else you wanna know?" Thunder Dash asked. "But this is fun" Tian sadly responded, "CHAOS STAR CHAOS STAR!" "Funny Tian, now I think they'll like you even more, are you felling like parting with Pinkie's cabin today or like I said, wanted to be liked" Maddie asked. "Why are you talking to a stray cat,Maddie, not ever your mother will be crazy enough to do that" Sunny Shimmers asked her then added, "Tian was hillious, he should do that tomorrow, anyways where is he?" Guardian Angel sat and ate. While he did he scanned the cafeteria in search for somepony to make friends with. His eyes landed on a certain mare when another pony appeared out of nowhere. He blinked a couple times to see if he was imaging it but the pony never went away. His curiosity got the best of him and he got up and made his way over to the two ponies. His armor made a clinking sound as he walked over to them. His armor was something no one has seen before. Instead of the usual gold armor the guards wore back in Canterlot, his armor was made to his specification. The way the armor was, it looked as though it was made of Griffon feathers that were tightly woven together. Upon closer look, the armor was indeed made of a very hard metal. After receiving his armor, Guardian made modifications to it so it will be lighter. On rare occasions will he ever wear his helmet, and seeing as he is in a new place, this is one of those occasions. He usually carries his favorite weapon on his back, but decided to not call upon it just yet. Sona was quite impressed by the way he recived his powers, and decided to shake her head no. "I-it's, alright.. That was quite, odd that you have a different structure, just like.. How apples, they have a different type then us. I, cant believe you got struck by lightning and saved that pony... That must of taken a brave heart and a courageous personality to do, unlike me... I'm too shy to do anything.."
But she was slightly interrupted by the sound of clanking noises coming this way, so she turned her head to see Guardian Angel headed to them. She leaped again when the seapony saw this Stallion in a certain type of armor, almost afraid of him from how intimidating he was to look at. Little did she know though, that Sona had pretty much lept into Thunder's lap and had an amazing grip hugging around him when Guardian had came. "Oh, I.. I, I-I didnt know you, were there, heh.. You startled me, I.. That was scary... Uh, um... Yeah, yeah... So.." But she realized who the pony was hugging and looked up, then immediately froze. Sonias tried her best to move away, but could only stand still with the most pale face you would of ever seen. "OHHHHHH, Do you want some popcorn mon" Tian meowed in his cat form and gave Iris a piece of popcorn with is paw. "Really, Maddie why is his eyes yellow and Crimson instead of yellow and blue?" "How do you know his eye color?" Maddie asked, Tian (Chaosstar) hissed at Sunny in his cat form..
"Last year when he first came to the school, He took his sun glasses off and showed them to me"
"What's going on here? Cinnamon asked..
"It's Tian, He, uh, turned into a cat" Amber spoke. Iris sighed, he knew that he didn't say anything, He smiled at Tian, "Wow, Tian you really made an enemy out of Sunny, wanna Brohoof, wait your a cat, Bropaw?" Guardian stooped when he saw the mare jump. He had no intentions of scaring anyone. He thought it would be best to take off his helmet and show his face and to give a proper introduction. He brought his hands up and removed his helmet. His messy, long, ivory white hair dangled down just a little above his ocean blue eyes. "I'm sorry if i startled you miss." he said with a bow. "Allow me to introduce myself. My name is Guardian Angel. Might I inquire what your names are." He gestured to the mare and stallion sitting down with a heart warming smile. If there is one thing that he is good at, it is that he will brighten up any ones mood, regardless of how deep they feel of hate, sadness, loneliness, or any negative mood. He believes that if he always wears a smile then everything will seem alright, no matter the circumstances are. Seeing as it may take some time for the mare to settle down from him scaring her, he decides to take a seat just a little bit away from them in case something goes wrong and he scares her again. Selena sighed, and scanned the mess hall, hoping there would be a trash can near her table. But with her luck, the only trash can was all the way accross the room. Selena squeaked, and picked up her tray; starting to shakily make her way accross the mess hall she suddenlly tripped and dropped her food on another demi-pony. Hastily, Selena picked up some napkins and began to wipe the food off of him. "Oh dear! I'm so sorry; I just tripped and...'' Selena stood up, and sqeaked. She hid behind her brown hair and scraped at the ground with her laced-up high tops. Why can't I just be brave for once; I bet Mom was much braver than me. "Um....I'm.... *squeak*" Selena looked down at her feet, and streched her wings, she was blushing a light pink. This is so emmbericing! Why can't I be like Mom or Dad and be able to talk to other people, I mean...he is cute. No! No, stop thinking about that- Mom said I wasn't allwed to marry any demi-ponies. I still don't understand why she said that, I mean that is part of what this camp is about right? A strant of brown hair fell from the orange butterfly clip that held Selena's bangs in place. She tucked it back behind the clip. The falling food caught Guardian by surprise. One minute he was waiting for the hope-to-be-friends to reply their names when he got covered in food. The one responsible hastily tried to clean the mess but she stopped when she looked at him. When he looked back, his heart skipped a beat. This girl was something his eyes have never seen/ The way she hid behind her hair made her look all the cuter. He shook his head and cleared his throat. "That is quite alright miss. I have had worse things dumped on me in the past." Guardian tried to make eye contact but either she shied away from the gaze or he would simply blush and avert his eyes. When he looked away, he noticed a piece of lettuce sticking out of his armor. He promptly pluck it off and ate it. "Well this is certainly one way to get some food." he chuckled at his little joke to try and help break the ice. Wanting not to be rude, he gave a curt bow." The name is Guardian Angel," he said with his warming smile, "And might I ask what your name is?" he asked looking up at her with his ocean blue eyes. Selena giggled when he bowed to her, it had stricken her by surprise. But it was a bit formal for camp. "My...my name is....Selena shy." "Selena Shy, a beautiful name, to an even more beautiful woman" Guardian said. 'Wow, nice going Casanova, cheesiest thing i have ever said.' he thought, mentally face palming. He watched Selena pick up what was left of her food and glass of something onto her tray. Soon enough, she tumbles and falls to the floor. He tries to catch her but at ho fast it happened he was a little too slow. Guardian cringed when she hit the floor, and watched as a piece of glass got stuck in her arm. He was shocked beyond words, he bent down and looked at her arm, "It doesn't look like anything serious. If you want, you can go to the nurses office while I clean up the mess. I feel it is a little my fault for not helping sooner." he said giving her his warming smile again. "Or, I can take the glass out myself and get you patched up. And i won't lie to you, it will sting when i pull it out." his warming smile turned to a caring smirk and his face turned a shade redder at the thought of helping this shy girl out, 'What is with this girl that makes my heart soar?' he asked himself mentally. After setting her bags in her cabin, Star Belle walked to the mess hall. "Let's try not to mess this up, shall we?" She took a deep breath, and slowly opened the door. Good gold, it's loud,Star thought. Well, no one's noticing me. Time to enter. She fast-walked to the counter and sped down the line, grabbing an apple, cheese sandwich, chocolate chip cookie and a chocolate milk*and paid for her meal(?). Scanning the cafeteria, she found a table with with a kelpie-like girl and some others. Well they look friendly, and nothing like the "popular" clique that exist in all books about high school. She carefully walked to their table, not wanting to trip over someone's foot and spill her lunch everywhere, like in the Dork Diaries**. Safely making it to the group's table, she sat down, a bit of a distance away, and started eating her sandwich. "If I go the nurse....what will..." said a brunette with glass in her arm. "It doesn't look like anything serious. If you want, you can go to the nurses office while I clean up the mess. I feel it is a little my fault for not helping sooner." (((((*I wasn't sure what food they offered, so I just made some things up. Guardian took notice to the new girl walking up to them. He heard her ask what happened, and being the gentleman he is, he answered. "This girl here, Selena Shy, accidentally spilled her lunch on me. She was quick to reply with an apology and started picking up the mess. When she got done and was leaving, she tripped again, but this time when she fell, a piece of glass cut her arm." he said standing up. His smile never faltering. "By the way, my name is Guardian Angel." he said holding out his hand for a greeting. "I'm Star Belle... Nice to meet you,Eeee..."Her voice went from a bit quieter than normal to a whisper. She nervously shook Angel's hand. He did have a friendly smile. She sat back down at her tray, and scooted a little closer to Angel's friends. "Um, so how is everyone else doing? A-anything interesting happen lately... Meeepp." She sipped some of her chocolate milk, waiting for a response. (((((OOC: It's sloppy, I know, but I can't put anything more, (not to mention I'm tried as buck) so here's some filler! Hello eveypony! I am Star Belle, and this my friend Spookalina! 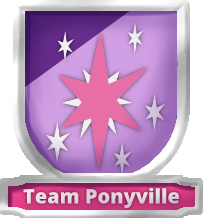 We moved from Manehatten to Ponyville, a few days before Nightmare Moon arrived-"Are you done yet? I wanna play on the the, um...""iPad. And no, I'm not done yet. It's hard to type. This thing was made for fingers." Selena turned on her heel, and averted her eys from the stranger. "Um...can you take it out Gaurdian? The nurae scares me..she never takes pity for me." She squeaked when she heaed Gaurdian speak her name. "Um..
.um...that's my name, yes..." Selena barley squaked befoew ahe hugged Gaurdian tightly. 'What is it about him? Why am I not afraid and yet this girl does?' Selena put her hands on her head. 'This is too much pressure, meeting new ponies is hard!' Selena suckes in a breath, and blew it out. She than reapeated that five times. "Um...so....who are your pony parents? *squeak*" 'I hope I get a new friend out of this, because that was seriously the dumbest thing I could ask. What if they are sensitive about being half pony, oh I wouldn't want to hurt their feelings. I guess the right thing to do now is juat wait for their reaction. Oh dear, I feel so guilty. Don't! Be brave like Mom and Dad. They would bw proud of you if you were. Stop being a wimp, nobody likes that!' Selena shook her head vigouresly. She bit her lip, and looked at Gaurdian with complete conern. Guardian shook his head in agreement when Selena asked him to take the glass out. His face grew redder when he was suddenly hugged by Selena. After she let go, his brain tried to analyze what just happened. He shook his head to clear it. "Okay, Selena, now just sit tight and this will be over before you know it. What I'm going to do is, I'm going to quickly pull the glass out and then wrap it up to stop it from bleeding." he said in a calming voice and his ever present smile. Ge grabbed her hand and pulled her arm to straighten it out so it will be easier to get the piece. He reached into his bag and pulled out some gauze and medical wrap. "Now remember, this will sting, but only for a moment." Guardian said to help reassure her. He grabbed the glass and quickly, but carefully pulled the piece out, then wrapped it up tight enough to stop the blood but loose enough as to not put any pressure on the wound that will probably hurt her. Unconsciously he kissed the wound, "Better?" he asked. Just then he realized what he did and his face froze in fear and surprise. Why he did that was out of force of habit. While out training, he would come across a young filly or colt who got injured. After he fixed them up, he would always kiss the wound to help ease the pain. Selena winced when the glass was being taken out, and blushed a bright pink when she felt Gaurdian's lips against her arm. She looked over her shoulder and smiled at him. "Um...yes, I'm fine...thank you for helping me." Selena looked up at him with pure happiness; and hugged him again; and quickly jolted back. She hid behind her brown bangs. "Um..sorry. I-um...thank you...nobody has ever been this nice to me before. It feels good to have a friend...for once." It hurt like heck to call him a friend. She wanted to call him much more, a boyfriend, a husbond. Selena found herself gazing into his eyes, thinking of what life would be like if they did get married. Gaurdian honked at the horn furiously. Selena looked at him with a weak smile from her spot in the back seat. "Drive you idiots! Drive like a real person! My wife is pregnant!" he honked the horn multiple times. "Gaurdian...it's red light; your hitting that horn for nothing." Gaurdian looked back at her and smiled. "I know, it's just...well our new baby could come any second! I have to get there as fast as possible no matter-" Selena giggled a bit. "Gaurdian." He fowned at her. "What?!" Selena pointed at the traffic light. "it's green."